the owner of the p2 Pilates Studio. Susan Spero danced professionally for a number of years after training as a sculptor and earning a degree in fine arts. In time, her experience with both dance and fitness led her to a masters degree in Expressive Therapies (music, art and dance. She then gravitated towards the fitness industry because it seemed a good way to combine her various interests in movement therapy, nutrition, weight training, physical fitness, and healing broken bodies. Convinced that no two bodies are exactly alike,so she developed the p2 Pilates Plus Method in order to combine Pilates with other conditioning regimes that include free weights, the Bosu ball, physioball, and cardio work. In her 30 year career as a fitness trainer, Susan has worked extensively with men and women who need or want specialized training programs because of injury, age, illness, or inclination. Thanks to her varied education, experience, and training, Susan can design programs for anyone, regardless of age or physical condition, and her goal is to provide personalized training programs precisely tailored to her clients' needs. 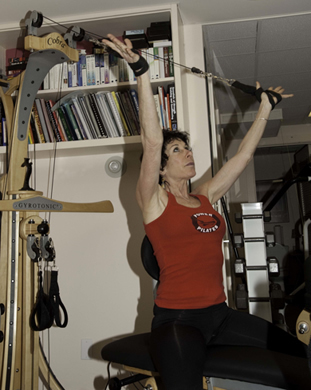 Susan has advanced certifications as an instructor in both Pilates mat and equipment as well as Gyrotonic®. She is currently a consultant for the Harvard University Wellness Program and teaches Pilates mat classes at Yale University. All training sessions are done by appointment at her p2 Pilates Studio located in New Haven.